One Heart Touch® has taken time to grow and mature into the system we know today. It has grown and evolved as I have evolved. Without a doubt, I have had to grow into the power of it. Certainly through the growth of OHT my own growth has matured rapidly, as you will see throughout the history of this great gift of Love that has come from the Council of Archangels and the Great Mother/Universe/Creator. But, to tell the history of One Heart Touch™, I must also tell a part of my own history, a part of my own spiritual Journey in Life, for they are eternally intertwined….. I have spent many, many years, with my family, in almost total isolation with the Archangels, the Great Mother, and Mother Earth as my only companions. My family and I have visited the fields of adversity more than a few times - sometimes with great difficulty and hardship, sometimes with great pain and sorrow. We have lived outside the Illusions of Life and lived within the Grace, Love, and Beauty that only Illumination experienced through the Heart can offer. I have come to know the Archangels, the Great Mother, and Mother Earth as my immediate family. They are my closest friends and confidantes. They have all shared a tremendous amount of deeply profound Understanding with me. They have schooled me extensively in the ways and workings of energy with knowledge and guidance in its processes as it Flows from the Great Mother throughout the Universe, the Earth, through and between the Souls, Spirits, Human beings and other incarnations, and more. The Archangelic Council has instructed me in the Universal Laws which we find in application in these energy interactions, as well as in our Life and health situations in this and other lifetimes. They have also provided me with an intensive education in the ways and workings of negative entities of all kinds – discarnate Spirits, extra-terrestrials, multi-dimensional beings, curses, vows, and so on, as well as their Releasements. It is worth noting that everything taught to me by the Archangels and the Great Mother, has come through first-hand experience. The knowledge that they have shared has, at times, been as extraordinarily difficult to accept as it has, at other times, been mystical, magical, and beautiful beyond words. A great deal of this knowledge is reflected in the One Heart Touch™ training and Healing methods. With this said…. What we know today as One Heart Touch® began in September of 1992. In the beginning, it was just a Light. I was awakened very late one night by the sense of a presence in the room. As I glanced around the room, I noticed one of my electronic devices was inexplicably on again, as I had found it for the previous several nights. As the device had an automatic shut off mechanism, it should not have been on at all. Yet it was there blinking away in a state of readiness. I looked around the room and saw something that I had not seen the previous nights. Near the ceiling on one side of the room was a faint circular glow. I held my breath and watched as it began to form into a column of brilliant White Light sparkling with golden shimmers. I was mesmerized as it slowly descended until it almost touched the floor. I could feel a tremendous Love, warmth, comfort, and Peacefulness emanating from it. I watched this White Light for several minutes before it ascended back through the ceiling. When it was gone, I arose and stood in the area the Light had occupied. I could feel the Love and Peacefulness, along with a marked and tingly warmth. I returned to bed, closed my eyes, and instantly fell into a deep sleep. The next day, I shared the incident with a friend who taught meditation. My friend suggested that I try to connect with this White Light (or being thereof) through a very deep state of meditation – a shamanic journey. I agreed and he facilitated the session for me. As I began the meditation, a vision came into focus very quickly. I saw a Native American village in a beautiful, grassy valley. From the village, I saw a figure coming toward me glowing with White Light. I recognized the energy instantly as the one that had visited me the night before. I moved toward it. As I drew closer, I could see the figure was that of a very old Native American man, dressed in the image of buckskin clothing, but brilliant with White Light and shimmering with gold. As we met we embraced, and tears of great Love began to Flow. This being of Light took me into the village. There he presented me to a group of eleven elders seated in a circle that he referred to as the Council of Elders, of which he was also a member. He continued into a lengthy dissertation during which he made it known to the Council that he had chosen and accepted me as his student. This being of White Light asked me then if I would accept him as my teacher. With no hesitation I did and he reached his palms out for mine. As our hands touched, his White Light extended from his hands into mine. The Light moved up my arms and filled my body until there was no difference between his being and mine. We were One in Light. The energy was so intense that it was difficult to breathe. This was my first attunement to the Golden White Light of Love which I later came to know as the energy of One Heart Touch™. At that Time, I did not know this being of White Light as the Archangel Raphael. Instead, he had instructed me to address him as Grandfather, for at that time, I was not open to receiving guidance from Angels. I had had too many painful experiences with others who believed in them. I continued to meet with Grandfather in meditations, and had an open and continuous clairaudient, clairvoyant, and clairsentient relationship with him. I could relay information from him to others using these gifts as well, especially in Healing sessions. For the next seven years, I learned a tremendous amount of information regarding Healing, the body, and how to use the energy of the White Light through my hands and other methods. During this time, I underwent significant evolutionary changes in both body and consciousness, and experienced many extraordinary events of Healing, including the rising of my own kundalini energies. In the fall of 1999, I was formally introduced to the Healing realms of the Angels through a variety of sources. I began seeing Angels on a daily basis. I found their presence to be incredibly Loving, comforting, and humbling leaving me with a deep sense of Grace. I met with them every day in my meditations. In one meditation early in January of 2000, I was joined by the Archangel Michael who initiated my verbal channeling processes. I was opened to a continuous clairaudient, clairvoyant, and clairsentient relationship with him as well. At that time, I began to receive information, guidance, and further attunements from him through my daily meditation and channeling sessions. The focus of the guidance and information in those early days was directed to the Oneness state of being. Through his infinite wisdom and Love, Michael guided me to know not only Oneness with my own Spirit and Soul, but Oneness directly with the Archangels and the Universe through my own Heart. I experienced many exquisite moments in which I knew absolutely no boundaries or separation between these beings of Love and myself. Words cannot begin to describe the absolute feelings of limitless Love, Joy, Peace, Grace, and Freedom I experienced. I wept many tears for the Beauty and humbleness which I felt then - and will ever continue to feel. The Understandings that came were far beyond that which words can speak. As I became more and more open to these experiences, Michael opened the energy channels within my body, with attunements, so that I could initiate this state of Oneness at will. It was then that I was further introduced to the formal attunements to the energy of what we call One Heart Touch™- the Golden White Light of Love. Michael also began to instruct me on the principle of the “One Heart” portion of One Heart Touch™. That principle, as he explained, is “The world can be Healed with just One Heart”. True Oneness begins with the self, then extends to our Spirits, our Souls, our Soul Families, the Universe/Creator, to the Earth, to each other, and beyond. It is this path of Oneness that we teach in the programs of One Heart Touch™. It is the very surrendering of self, to become One in Heart with our Souls, the Archangels, and the Divine, that allows the energy of One Heart Touch™ to come forward for Healing and evolution. This state of “One Heart” is the very crux of the One Heart Touch™ processes. Once I was fluent in the process of initiating this state of Oneness and bringing through the energy of the Golden White Light, Michael began to guide me in the Understanding and experience of Oneness with the Earth, Humanity, the other beings who share the Earth with us, and beyond. I was given many Insights into pain and suffering, not only of Humanity but of other beings as well. I was also schooled in the relationships between Human and other beings of Life, Spirits, Souls, the Great Mother/Creator, and the Earth as they pertain to this and other incarnations of our Souls and Soul Families. In March of 2000, the Archangels Raphael (to a further degree) and Gabriel also began contributing to the One Heart Touch™ processes and training by providing me with further attunements, information, and guidance. It was then that I learned that Grandfather and Archangel Raphael were one and the same. I learned that the Council of Elders was also known as the Council of Archangels. At that time, I realized the Truth of the Understanding that the Universe/Creator has many faces for the messengers He/She/It sends to help us through Life. Such is the Beauty of the multi-dimensionalness of the Great Mother. She speaks to her people in a multitude of ways without the barriers of religion, ideology, dogma, or judgment. In late summer of 2000, the Archangel Uriel joined the team of Archangelic guides. The relationship standard between the Archangels and myself became one of clairaudience, clairvoyance, clairsentience, and clairaugustus. I could always see, hear, and speak with them. Many times I would simply know the answer to a question as the thought of it arose - without a spoken response. I smelled the sweet scent of flowers more often than I did not, and always knew the Archangels were present. In September of 2000, Uriel began bringing forth the One Heart Touch™ symbols through my daily meditations, channeling, and “communion in hand”, as he called it (automatic writing). Archangel Uriel gave me more than 50 symbols to use for Healing and evolution with the OHT energy. In 2002, Archangel Metatron also joined in giving symbols for the OHT processes. These symbols have been called angelic writing by some. Others have felt that they are a form of Universal language. As they have been taught to me, they are simply a way to direct the OHT energy for a specific purpose. There were other Angelic presences who were a part of the initial One Heart Touch™ team. Throughout the first year (2000) of formal OHT, I was introduced to and received information, attunements, and guidance (through my meditations and channeling) from the Archangels of Love, Vision, and Truth. The Angels Edzekiel and Cassius also contributed to OHT that year, rather like passing “guest speakers”. On December 24, 2000, after spending 33 days meditating and fasting, I was again taken into a special visionary meditation with the Archangelic Council. This time, it was the Archangel Uriel who presented me to the Council and officiated the meeting. During this meditation, I was attuned to the energies of the Council as a whole and Empowered to teach and attune others to the Golden White Light of Love and the One Heart Touch™ symbols and techniques. I was instructed in how to share this gift under the guidance of the Archangelic Council and with their blessing. So, I began developing and writing the formal program of One Heart Touch™. In 2001, I had the first levels of training ready and accepted the first One Heart Touch™ students. At the same time, I began accepting OHT clients. It was very quickly evident that the OHT system was a tremendously dynamic tool for Healing and stimulating evolution of consciousness. It also proved to be equally as easy for the novice and the experienced energy worker to learn. As the Journey of OHT continued, my interactions with the Council of Archangels steadily grew, as I was introduced to and received guidance and information from one after another of them. At the time of this writing, the Council is made up of twelve members as I know them. They are the Archangels Michael, Raphael, Uriel, Gabriel, Metatron, Agahaphiel, and the Archangels of Truth, Vision, Love, Abundance, Cosmic Affairs, and Physical Principalities. I received what I thought would be the last One Heart Touch® symbol in November of 2002, being given by the Archangel Metatron. However, in late 2012 Archangel Uriel indicated to us that we may yet have further levels of OHT with more symbols available to us. 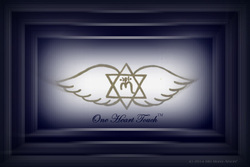 In 2016 Archangel Metatron gave yet another symbol for use with the One Heart Touch® energies. One Heart Touch® continues to grow and evolve, especially in its variety of applications. The ways that we can use it are endless. It remains to be an incredible and incomparable tool of Healing, Transformation, evolution, and Protection. I have yet to find or learn of any situation that the One Heart Touch™ system cannot provide assistance in whether it is for humans, animals, or any other being of Life. In the biological body, we have Healed broken bones, reversed bruising, shrunk and/or eliminated fibroids and cysts, regenerated muscle tissue, stopped bleeding, and more. In addressing the mental or emotional needs of our clients, we have seen many instances of rapid Healing as OHT helps in Releasing old hurts and negative thought patterns. In a spiritual sense, the evolution in consciousness that OHT stimulates has truly been astounding as we have witnessed it in our students and clients alike. When dealing with situations of Protection, clearings, and Releasing negative entities, including discarnate Spirits and “ETs”, One Heart Touch™ is unparalleled. I have experienced and witnessed many miracles on many levels through the use of this magnificent gift. I have no doubt that there will be many more. As for myself, I shall ever continue to meet daily with the Archangelic Council in meditation, channeling, and various other forms of communion. The Great Mother, Mother Earth (Sister Gaea), and Brother Helios (Father Sun) are also part of the group whose guidance I am inspired by every day. I shall continue to seek their guidance for One Heart Touch™, its advancement, its teaching, and its Healing and evolutionary potential and applications. As with any system using an energy as its base, it will always shift and evolve as energy does. However, as One Heart Touch™ shifts and evolves, it will be under and with the guidance, governance, and Protection of the Archangels. This is too precious a gift to allow it to be altered out of the pure state of Love that it is. It is a part of my Purpose in Life not only to bring forth this gift of One Heart Touch™, but also to guard and Protect it from adulteration and dilution on every level I can. This I shall always do, even with the Grand (Guardian) Masters to come. One Heart Touch® has profoundly changed my Life. It has brought great Love and depth to my being, my Life, my family, my world, and all those people, places, and creatures of Mother Nature and the Universe that I have been blessed to touch with it. I have experienced the occurrence of many mystical and powerful moments through the practices of OHT. I know they will always continue. As I move forward in sharing One Heart Touch®, it is my hope that it is ever received in the place from which it has come – the place of One Heart, with the power of Love and Joy, Peace and Truth, and the guidance and Support of the Archangels and the Great Mother. We can Heal the world – One Heart at a Time.